Kitchen knives by Gerber. Gerber Little Snick, Gerber Durendal, Gerber Snickersnee, Gerber Ron. Different conditions. All do not have sheaths. Each knife has a price by its description. All are used but have much life left in them. Kitchen knives by Gerber. Different conditions. All do not have sheaths. Each knife has a price by its description. All are used but have much life left in them. 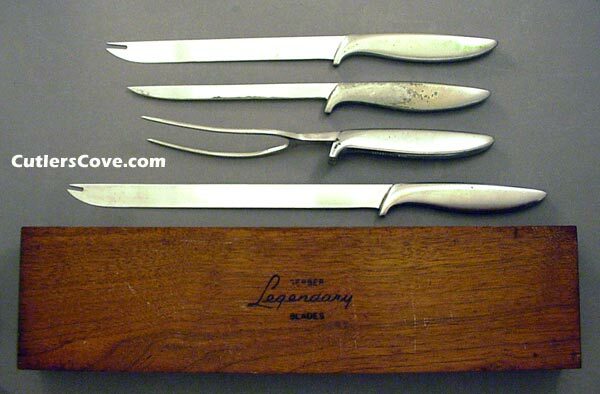 All on this page are from the Gerber series of kitchen knives that are in the Museum of Modern Art design collection in New York City. This page and website is copyrighted. Copyright © 1999 - 2011 Cutler’s Cove Knife Emporium ™ All rights reserved. The first one is a at the top part of the photo, 12-3/4" overall, chrome aluminum handle and high speed tool steel blade. Carving and serving blade, very good plus, sharpened. Small scratches on the blade and handle. No sheath. Marked Gerber Little Snick. Made in the USA. 1. Gerber serving fork, 11" overall with chrome aluminum handle and high speed tool steel blade. Very good plus condition with light tarnish and small spots of missing chrome finish on the handle. Marked Gerber Ron. No sheath. Made in the USA. This is part of a set of the last three items in the above photo. Click button below for how we grade knives. Sold as as a set of three items only! 2. Gerber carving and serving blade with chrome metal handle, 15-1/8" overall with chrome aluminum handle and high speed tool steel blade. Very good plus condition sharpened with tarnish spots on the blade. Marked Gerber Snickersnee. No sheath. Made in the USA. This is part of a set of the last three items in the above photo. Sold as as a set of three items only! 3. The Gerber box is worn and can be refinished because it is solid walnut wood and not particle board or veneer. The box can be made to look beautiful with sanding and applying a new finish. In the photo above you see the bottom of the original Gerber box. The inside red flock lining is coming off but there is an old metal Gerber shield with Excalibur (1-1/2" wide) on the inside lid that is valuable to a Gerber collector. Circa 1950's to 60's. This is part of a set of the last three items in the above photo. Sold as as a set of three items only!